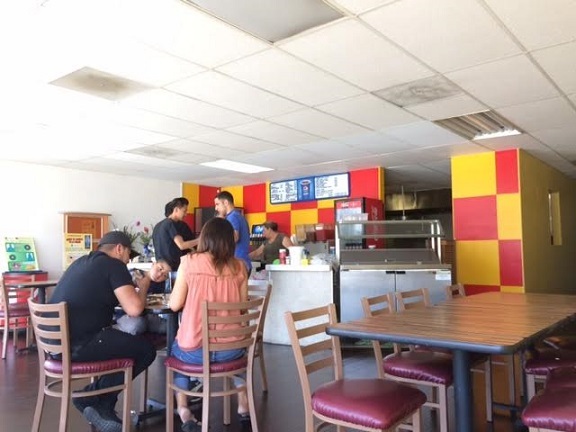 When last we left Lily’s Tacos, operating from a former Orange Julius stand since 1992, the shopping center it was in was being renovated and the stand, then on the edge of a construction zone, was due to be demolished. Lily’s moved earlier this year to an indoor location below the 10 Freeway. 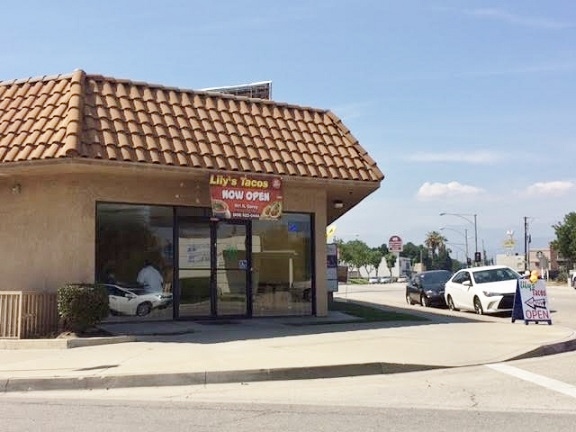 There’s also a second location, in the La Verne Village center, at 2855 Foothill Blvd. The La Verne restaurant appears almost genteel. Even the Pomona restaurant is a big step up from the picnic-style seating of the original. It’s in a brown, stuccoed building next to Flower Lane Florists, with parking in back or on the street. You order at the counter from the limited menu of tacos, burritos and combination plates. I got an al pastor burrito (about $5.50). 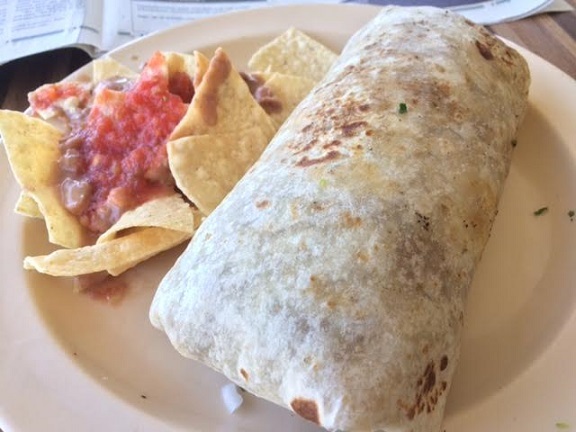 The burrito was pretty good, and I think Lily’s place as one of the better taquerias in Pomona has survived the move, even if the ambience of the previous incarnation is missed. The plate still comes with a scattering of tortilla chips with a smear of beans and salsa, just like the old days. Perhaps the spirit of the old surroundings lives on in the slightly makeshift quality to this Lily’s. I asked for utensils and was directed to a cheap, three-drawer plastic dispenser on the counter, from which I withdrew an aluminum fork and a plastic knife, one of them from a drawer that wouldn’t open all the way. It was a little comical given the relatively upscale interior. And the restaurant still doesn’t appear to have an online presence. The building occupies a corner and is angled toward the intersection. Through the expanse of floor-to-ceiling windows, the sidewalk is just steps away. Cyclists rode past. Pedestrians walked dogs or pushed shopping carts. Cars whizzed by. The windows were a screen on which the passing parade played. Needless to say, a window seat is recommended. As is the al pastor. 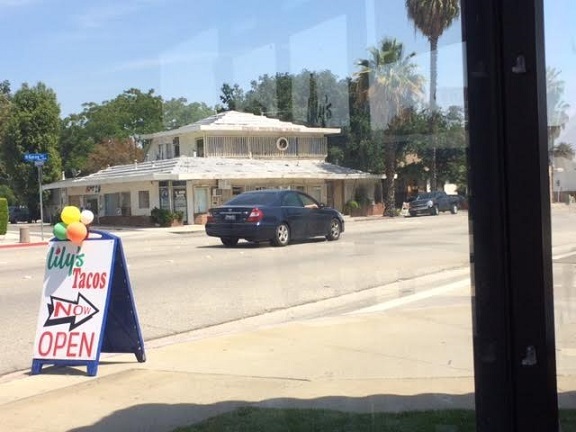 This entry was posted in Restaurants: Pomona and tagged Pomona, restaurants, taqerias by David Allen. Bookmark the permalink.